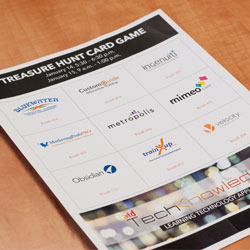 The Treasure Hunt Sponsorship is a fun and unique way to promote your company. Each attendee will receive a Treasure Hunt Map and will be tasked with visiting all participating sponsor booths in order to obtain a stamp or signature – guaranteeing traffic flow to you. Attendees collecting all stamps/signatures will be entered into a raffle to win one of three great gifts. Sponsor’s name and logo will be printed on the Treasure Hunt Map.